Major hardware components: Both series use the Jedi generator and the Performix 160A X-ray tube. They also use the same positioner stand. Until the fourth quarter of 2015, they came with the same digital detectors too. Omega IV and V table options: Innova and IGS labs can both be found with the basic Omega IV and the longer Omega V table options. RTAC 8 Computer: Until late 2015, both series used the RTAC 8 to control the image acquisition process. InnovaCentral touchscreen table-side control: Most of the functions of models from either series can be manipulated at the side of the table from this controller; system configuration, movements, fluoroscopy modes, zoom, etc. In addition to the Omega IV and V table types offered with the Innova series, the IGS series adds the Innova IQ V3 and V4 for more tilt and lateral movement choices. The original tilting table option for the Innova series is the Elegance table. Additionally, starting in late 2009, Innova systems had the option of being outfitted with Innova IQ or IQ 2 tables. DL8-2 computer: The IGS started with the same DL8 computer as the Innova, but soon switched to the DL8-2. Coolix 4100 chiller: This is the newest iteration of the Coolix chiller. Not a lot has changed in terms of function, but because they are newer options for service will be more limited. Color scheme: This is purely a cosmetic change, but IGS labs do look pretty sharp. Each of these changes represents incremental improvement in component design and performance but, even taken in aggregate, do not constitute a dramatic difference in the user experience. Strong parts availability / reasonable parts pricing: With more years under their belt and a much wider install base, third-party parts availability for Innova systems is much greater. This, of course, also means that parts for Innova systems will cost much less than those for IGS systems. IGS units, specifically the 2015 and newer models with different detectors and DL8-2 or DL9 computers, will be difficult to find parts for for a few more years. 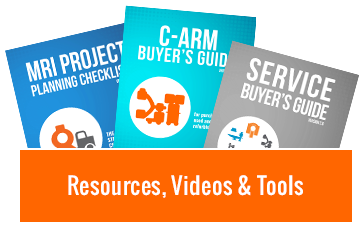 Many parts purchases will likely have to be made through GE at significantly higher cost. Serviceability: IGS units are more limited in terms of third-party service. 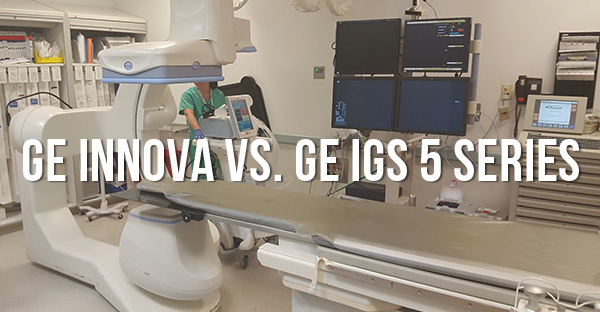 The Innova series is the bread and butter of any independent GE cath engineer. Newer dates of manufacture: There are basic advantages to more recent manufacture in terms of wear and tear and component longevity. Familiar format and use: If your team has used the Innova series, the learning curve to transition to the IGS will be minimal. Site planning: If you are upgrading from an Innova series system to an IGS, the site planning work is the same. For the foreseeable future, used IGS 5 series labs will continue to be rare and, when available, to command high-end prices. For facilities that have the time to wait or the money to spend, an IGS 520, 530, or 540 cath lab will be a fine system with the latest "bells and whistles" and the longevity benefit of a later manufacture date. Those needing a more budget-conscious solution, and sooner, can have virtually the same technology and user experience by choosing a refurbished Innova 2100, 3100, or 4100.